What does it mean to be transgender? How do we discuss the subject? In this eye-opening book, CN Lester, academic and activist, takes us on a journey through some of the most pressing issues concerning the trans debate. from pronouns to Caitlyn Jenner; from feminist and LGBTQ activists, to the rise in referrals for gender variant children - all by way of insightful and moving passages about the author's own experience. 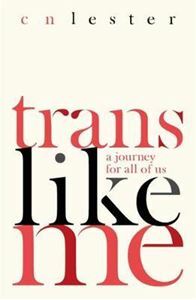 Trans Like Me shows us how to strive for authenticity in a world which often seeks to limit us by way of labels.